One day, two fellows calling themselves weavers came to town. They said that they knew how to weave cloth of the most beautiful colors and patterns. The clothes made from this wonderful cloth would be invisible to everyone who was unfit for the job he held, or who was very simple in character. “These must, indeed, be splendid clothes!” thought the Emperor. “If I had such a suit, I might at once find out what men in my kingdom are unfit for their job. I would be able to tell the wise men from the foolish! This stuff must be woven for me immediately.” He gave large sums of money to both the weavers in order that they might begin their work at once. So the two pretend weavers set up two looms. They worked very busily, though in reality they did nothing at all. They asked for the finest silk and the purest gold thread. They put both into their own knapsacks. Then they pretended to work at the empty looms until late at night. “I should like to know how the weavers are getting on with my cloth,” said the Emperor to himself one day. When he remembered that a simpleton, or one unfit for his job would be unable to see the cloth he began to worry. To be sure, he thought he was safe. However, he would prefer sending somebody else to bring him news about the weavers, and their work. All the people in the kingdom had heard of the wonderful cloth. All were eager to learn how wise or how foolish their neighbors might be. So the faithful old wise man went into the hall where the thieves were working with all their might at their empty looms. “What can be the meaning of this?” thought the old man, opening his eyes very wide. “I cannot find the least bit of thread on the looms.” However, he did not say his thoughts aloud. The thieves asked him very kindly to be so good as to come nearer their looms. Then, they asked him whether the cloth pleased him. They asked whether the colors were not very beautiful. All the time they were pointing to the empty frames. The poor old wise man looked and looked. He could not see anything on the looms for a very good reason. There was nothing there. “We shall be much obliged to you,” said the thieves. Then they named the many colors and described the pattern of the pretended stuff. The old wise man listened with care to their words so he might repeat them to the Emperor. The thieves asked for more silk and gold saying that it was necessary to complete what they had begun. Once again they put all that was given them into their knapsacks. They went on working with as much effort as before at their empty looms. The Emperor soon sent another man from his court to see how the weavers were getting on. Now he wanted to know if the cloth would soon be ready. It was just the same with this gentleman as with the wise man. First he looked closely at the looms on all sides. He could see nothing at all but the empty frames. “Does not the stuff appear as beautiful to you, as it did to my lord the wise man?” asked the thieves of the Emperor’s second advisor. The whole city was talking of the splendid cloth, which the Emperor had ordered to be woven. Finally, the Emperor himself wished to see the costly material while it was still in the loom. He took many officers of the court and the two honest men who had already admired the cloth. As soon as the weavers saw the Emperor approach, they went on working faster than ever although they still did not pass even one thread through the looms. “How is this?” said the Emperor to himself. “I can see nothing! This is indeed a terrible affair! Am I a simpleton, or am I unfit to be an Emperor? That would be the worst thing that could happen—Oh! The cloth is charming,” said he, aloud. “I approve of it completely.” He smiled most graciously and looked closely at the empty looms. No way would he say that he could not see what two of his advisors had praised so much. Everyone with the Emperor now strained his or her eyes hoping to discover something on the looms, but they could see no more than the others. Nevertheless, they all exclaimed, “Oh, how beautiful!” and advised his majesty to have some new clothes made from this splendid material for the parade that was planned. “Magnificent! Charming! Excellent!” was called out on all sides. Everyone was very cheerful. The Emperor was pleased. He presented the weavers with the emblem of an order of knighthood. The thieves sat up the whole of the night before the day on which the parade was to take place. They had sixteen lights burning, so that everyone might see how anxious they were to finish the Emperor’s new suit. They pretended to roll the cloth off the looms. They cut the air with their scissors and sewed with needles without any thread in them. “See!” cried they, at last. “Yes indeed!” said all the courtiers, although not one of them could see anything of this special cloth. The Emperor was undressed for a fitting, and the thieves pretended to array him in his new suit. The Emperor turned round and from side to side before the looking glass. “I am quite ready,” said the Emperor. He appeared to be examining his handsome suit. The lords of the bedchamber, who were to carry his Majesty’s train felt about on the ground as if they were lifting up the ends of the mantle. Then they pretended to be carrying something for they would by no means want to appear foolish or not fit for their jobs. The Emperor walked under his high canopy in the midst of the procession, through the streets of his capital. All the people standing by, and those at the windows, cried out, “Oh! 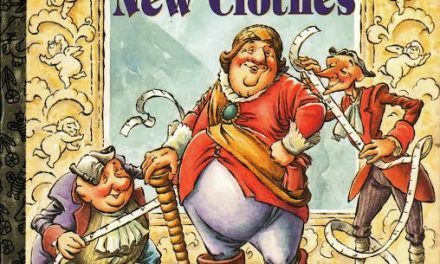 How beautiful are our Emperor’s new clothes! What a magnificent train there is to the mantle; and how gracefully the scarf hangs!” No one would admit these much admired clothes could not be seen because, in doing so, he would have been saying he was either a simpleton or unfit for his job. “But the Emperor has nothing at all on!” said a little child. “Listen to the voice of the child!” exclaimed his father. What the child had said was whispered from one to another. “But he has nothing at all on!” at last cried out all the people. The Emperor was upset, for he knew that the people were right. However, he thought the procession must go on now! The lords of the bedchamber took greater pains than ever, to appear holding up a train, although, in reality, there was no train to hold, and the Emperor walked on in his underwear. Thumbellina – English Podcast – Sulthan M. M.